Know kids who love to make slime? My daughter was recently asked to make slime with young girls after their mom had surgery to entertain them for a while. They had lots of fun! Look what we found for you on Amazon! Hurry and get the Elmer’s Liquid School Glue, Clear, Washable, 32 Ounces – Great for Making Slime today for only $13.99 NOW $7.96 from Amazon! This will make a LOT of slime! This product has many variations at different prices! Quickly see them all here. Check out all of the Amazon deals here! Want to make slime? Start with Elmer’s Washable Clear School Glue! 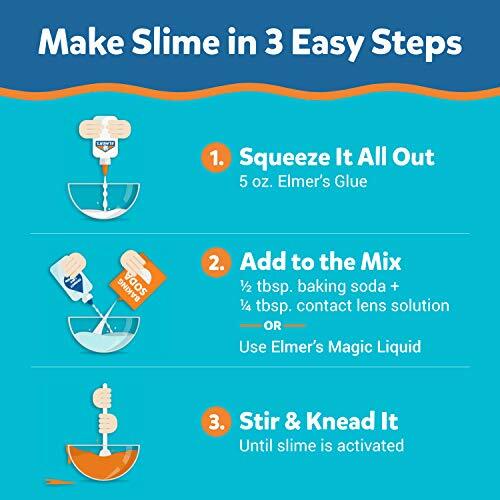 The smooth, clear glue formula creates a transparent slime base to customize with color – just follow the Elmer’s kid-friendly recipes. Specially formulated to be washable, safe and nontoxic, Elmer’s School Glue is also great for attaching items to paper, wood, cloth, and more. Adjustable before setting and drying clear for reliable results, the Elmer’s glue is excellent for class work as well as home arts and crafts. Use trusted Elmer’s liquid glue to create fun slime and creative art. Buy the ELMERS 2024691 Elmer’s Liquid School Glue, Clear, Washable, 32 Ounces – Great for Making Slime from Amazon. Next articleGround Beef Hobo Stew – Great Cold Weather Stew!